My trusty vacuum cleaner was finally due for replacement. I used a Hoover Spectrum 850 for about twenty years. After a few years the lid port where the hose connected broke off, and I solidly repaired it, which increased the unit’s suction power. A few tweaks later and that vacuum kept chugging. It finally succumbed to a splitting hose which, on a unit that old, was a death stroke. I recently ran across a one-day sale on Dyson Ball Animal vacuums at Home Depot at a price I couldn’t pass up. I’d heard nothing but good things about Dyson products and was eager to give it a try. It arrived last week and I snapped it together. The unit is mostly made of plastic, which makes me nervous, and a web search turned up other people with the same unease. 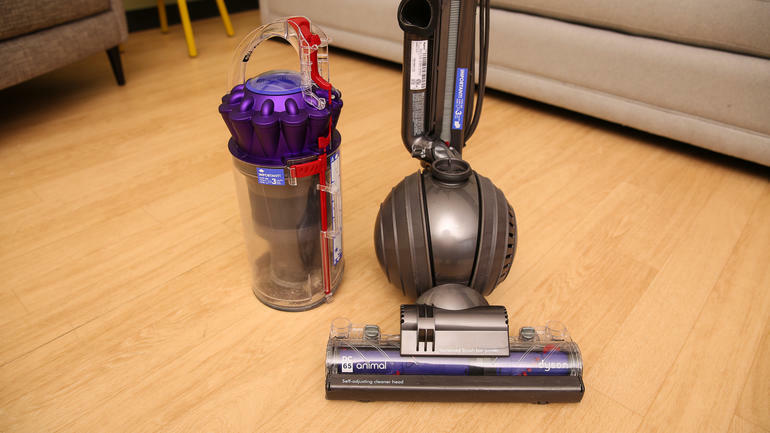 Dyson responded to one person’s complaint by claiming the vacuum is made from a special combination of flexible plastic reinforced with fibers to make it lighter while still being strong. As someone who over-engineers anything he builds, I’m still uneasy. For example, the handle seems weak and too flexible until you insert the plastic wand into the collapsible hose, which then clips into the handle. The handle then feels more substantial. The main power and beater brush switches are mushy–there’s no solid ‘click’ when they are operated and that drives me crazy. But the switches do function, which I’ve verified by using the unit. These kinds of “user experience” items can be a turn-off with some buyers, and I believe Dyson should spend some time on that end of their product engineering processes. I fired up the unit and swept my living room. One of my two dogs is in the process of blowing out his coat so I expected more hair than usual, The collection canister rapidly filled and I had to dump it twice. Not only was there hair but a good amount of other dirt and cruft. Dyson claims their beater bar digs deeply into the carpet and I believe them–the carpet is nearly fifteen years old and had been compressed in places. The sweeping fluffed up the carpet so much that it looks almost new. When I emptied the cyclone canister after the first run-through I noticed that the collected dirt looked damp. I quickly realized that I’d run the unit over an ‘accident’ and sucked up some urine with the dirt. Sure enough, I found the spot and avoided it on the second run. I filled the canister again and yet again when doing the bedroom. I noticed some dirt on the inside of the clear sweeper foot but didn’t have time to clean it out. Several days later I removed the foot from the sweeper. Thanks to the urine I’d sucked into the unit, the dirt had formed a felt-like coating inside the foot that wasn’t removable by simply plucking it out. I disassembled the foot, removing the beater bar motor assembly and going over the inside of the foot with glass cleaner and paper towels. Soon it was clean and ready-to-use again. The foot was clearly not designed to be disassembled by the end user. Three of the screws holding the top and bottom halves together are hidden under the beater bar, and in my case were completely hidden under the felt-like dirt covering. There were also a number of places with gaskets where different pieces connected, helping the unit to maintain that famous Dyson suction. I had to carefully clean any loose dirt from those areas to ensure solid seals when everything went back together. In looking through the manual and online how-tos, I discovered several places where the end user can fish clogs out of the air path. Each of those places include gaskets to maintain the suction. Perhaps it was due to my accident, perhaps the sheer amount of dirt and hair collected, but I had to fish out some collected dirt clogs while I inspected the unit. The fabled Dyson suction is REAL. This vacuum works extremely well. Several people said in online reviews that their units ‘quit working’ or stopped picking up dirt after a few months. Given my discoveries they probably needed to search for, and remove, clogs in several places. All those seals work to maintain the suction, but I can’t help thinking of Scotty in Star Trek III: The Search for Spock when he says, “The more they overthink the plumbing, the easier it is to stop up the drain.” Did you know the early Chevrolet Corvair cars had well over 100 seals in their engines? (Or so I was told years ago by a car nut friend of mine.) They constantly leaked fluids because of seal failure. Any kind of rubber seal will eventually harden and crack. I’m willing to bet the various Dyson seals aren’t available separately for end-user replacement, if at all. I don’t appreciate the mushy-feeling switches. I’m not sure they’ve been energized until I hear the vacuum turn on or the beater bar start spinning. If the foot gets dirty again, it will be major inconvenience to open and completely clean it out. The abundance of plastic in the unit’s construction may have been a blessing when I accidentally rolled over that urine accident. If, however, there was any metal in the air path (motor, etc.) those parts will start corroding over time. I’m not sure if I’ve prematurely started a countdown clock to the unit’s eventual demise. Overall I’m pleased with how well it picks up. We’ll see how it holds up–if it quits working after the 5-year warranty is up, I may buy something from another manufacturer. My carpet feels nearly new again, although it still needs to be replaced due to its age. UPDATE: I’ve used the Dyson several times and overall am pleased with it’s operation. I’ve discovered a glitch in the design, though. The foot, which is designed to maximize suction, has a number of little rollers on the bottom that get clogged with pet hair. The hair wraps around the axles and binds the rollers, which makes moving the unit difficult. I’ve had to remove the foot and work the hair loose using surgical hemostats. One roller was stubborn and also required some cutting of the hair with a small X-Acto knife before it could be removed. This is a major weakness.